Facebook and location: what if Facebook knew where you were? The twitterific app on my phone has been bugging me to let it geotag my tweets since I updated it a few weeks ago. And it’s not the only piece of software that wants to pinpoint its users on the giant google-simulated globe. Web companies have flagged up location as The Next Big Thing and everyone’s into the microlocal right now. But do we want it? Thanks to google maps and gps on smartphones, you know your phone can pinpoint your location right down to what part of a house you’re in, and if the view isn’t clear enough in hybrid you can always slip into streetview, and get a nice clear picture of what the place looks like. Most people agree it’s really useful when your smartphone knows where you are, but what if it started sharing that information with other people? From personal experience and from a quick poll of twitterati, it hardly seems to be a popular prospect. “Nope” from @guinnessdj was one of many responses in the negative and there seemed to be some untold stories about the downside of being easily located on social-networking sites: @CMRLee says:”absolutely not. I’ve been out before when someone i was with tweeted it and we got an uninvited guest…” We imagine it wasn’t Stephen Fry. Google has had this kind of friend locator system up and running with Latitude (see Susi Weaser’s review) but I mean, how many of your friends sign up to that huh? On the other hand, I imagine a lot of your friends are signed up to Facebook. And if Facebook introduced something like that for its smartphone applications, combining Latitude technology with its huge numbers of subscribers, the result could be big. It obviously hasn’t been released yet, but sounds like they’re working on it. Of course this would be one of those functions that you can switch on and off. The question is how easy it’s going to be to remember to do that. I’m torn. Part of me gets paranoid about it. Part of me is saying “wow, that’s just like the map they have in Harry Potter” and envisaging all the times I could switch it on and browse a map crawling with little blue dots, knowing that those dots were my friends. As some twitterers point out, if you can toggle on and off location services easily, that’s okay, and there are a few out-and-out supporters: @radioedit says “the times when it’s useful far outweighs the times when it’s not” or as @mikewhillis puts it, letting people know your location helps them target you with more useful information. Like Facebook chat function (which I mostly ignore, but is sometimes great), Facebook location map would be fun if you were drifting around killing time and found someone nearby. But, as some sage commentators pointed out, something like this would definitely encourage you to prune back on the fringe elements of your Facebook friend collection. Well, this is my first visit to your blog!Your blog provided us valuable information to work on. You have done a marvelous job! You can have your location updated today in facebook, simply sign-up with FireEagle. 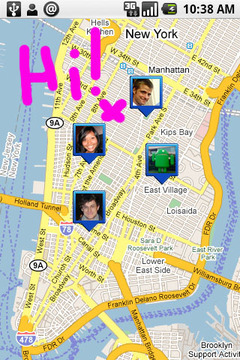 FireEagle is a personal location repository (by yahoo). Once your location is updated there, it can be read by many (pre-authorized) applications. Some of them work inside FaceBook (like Friends on Fire). I believe google is implementing something similar. Location Based application are definitely The Next Thing, But it wont fly until those companies providing the services figure out what are the right business models and how to make money. Its not so much them know where I am thats the worry, but them keeping a list of where I have been. Bellieve me, I do map databases for a job, and know just how much data can be gained from simple things like this and store points cards etc! Sounds like you are describing centrl.com — Murat (founder) is doing some very exciting work with this Modular Innovation, wrapped in a cool UX package.